Perfect on a cool crisp morning, or any time you’re in the mood for a hearty delicious breakfast, this easy-to-make oatmeal bake is packed with creamy banana flavor reminiscent of its namesake! Whether it’s a special occasion or not, you’ll feel like it is with each scrumptious bite. That’s why this is one of our favorite breakfast recipes to serve when we have guests. Simply double it for an easy, yet impressively delicious breakfast-bake that everyone will enjoy! 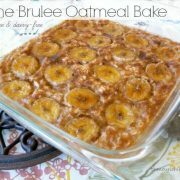 In a large bowl, add all of the ingredients listed, except the oats and banana. Then whisk together, until well combined. Using a rubber spatula, stir in the oats. Then, fold in just half of the banana slices. Transfer mixture to the prepared baking dish, making sure to even out the top. Then arrange the remaining banana slices on top of the oat mixture. Bake for 30 minutes until golden brown and center is set. Then, remove the oatmeal bake from the oven. Sprinkle top with a teaspoon or two of rapadura (or sucanat). Turn the oven on broil and carefully watch the oatmeal as you broil the top about 1-2 minutes, until browned and bubbly. Allow oatmeal bake to cool on stovetop for 3-5 minutes. Then serve with a splash of your favorite milk. Enjoy! What is your favorite oatmeal bake? I woke up to this pretty picture in my inbox and how could I not make it? Breakfast burritos could wait till tomorrow. I didn’t have coconut milk so subbed dairy and sprinkled pecans on top while under the broiler too. We eat the whole dish. Thanks! I have all these ingredients on hand and am making this TODAY! This sounds delicious!! I look forward to trying it. I’m drooling all over myself. Delicious! Oats were perfect. Tastes like a healthier version of banana pudding. Our family loves it. Hi and thank you for this recipe. It looks delicious. 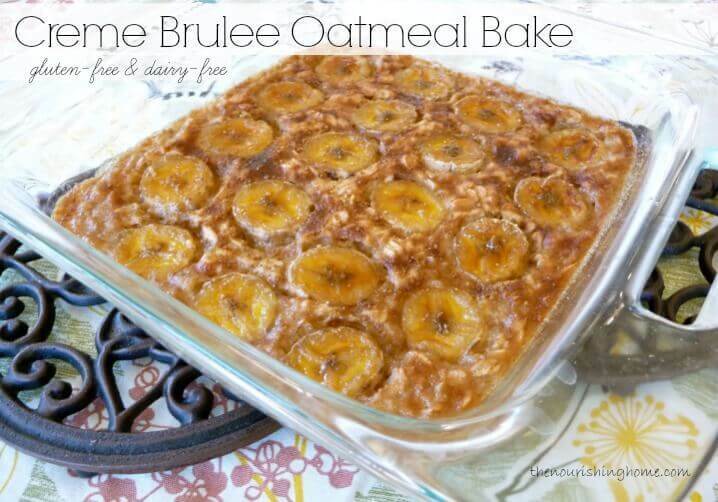 I am wondering whether this can be done with steel cut oats. Also, I was just told I’m allergic to eggs. Is there any way to replace that egg (until my body heals this allergy)? Thank you! Is it possible to use coconut milk that is not canned? Where is the ingredients list?? We love this recipe, but I’m frustrated that the ingredients seem to have disappeared! Sorry about that, just got the recipe fixed! How much maple syrup is used. I don’t see the measurement in the ingredient list, it just says maple syrup. Would love to make, it looks delicious! Thanks for your help! Hi, I just made this with quick cooking steel cut oats and almond milk, as that’s what I had on hand! It is a bit dry and chewy. Not awful, but there’s no way we’d will eat the whole pan. Any suggestions for salvaging it? i’ve made this several times and love it. but since the revisions, the amount of maple syrup isn’t showing up. how much maple syrup please? i can’t remember. thank you!! !